Most photographers have some sort of speciality, a discipline that they have been pursuing either through their career or as an amateur. This might be landscape photography, underwater photography, and so on. When setting up a new photography business, however, it is clearly necessary to operate in an area in which there is sufficient work to maintain a stable turnover and to continue to be able to pay the bills; this is not necessarily the case with some of the more esoteric disciplines. School photographs, however, are a fairly safe bet – there will always be a call for school photographs, and there will therefore always be a need for school photographers. School photography is essentially portraiture, but with a number of unique variables that apply only to the school situation. 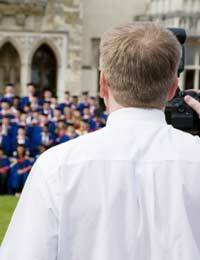 In the first instance, most people do not have any amateur experience of school photography, unless they have perhaps worked as an assistant to a school photographer. This is in contrast to most other photographic disciplines; professional underwater photographers, for example, have generally been doing underwater photography for some time before they turn pro. As such, there may be a fairly steep learning curve. This learning curve is likely to begin with equipment, which is likely to represent a significant initial outlay for a new photography business. Obviously you will require a camera and, in reality, there is no option but digital in this situation. Most of your competitors will promise to deliver proofs to the school within five days of the shoot; this is only realistically possible with digital. You will then require some sort of portable lighting rig. This will probably be geared towards individual headshots; you may, therefore, need two or three lamps, along with a soft box and a few reflectors. You should also consider, however, that you are likely to be required to take large group shots. Lighting an entire school year is probably impractical, so you will have to make creative use of natural lighting, perhaps with the aid of several reflectors. The shoot itself is not necessarily the most labour-intensive part of producing school photographs. While this can be a long process, the processing and editing is likely to take even longer. School photographs generally take on a uniform appearance; evenly lit three-quarter portraits against a textured background. In order to maintain uniformity throughout the entire set, you should obviously ensure that your lighting remains the same. After the shoot, however, you should be using batch processing; this feature performs the same operation on a large number of images without the need to repeat the action individually each time. Pricing is an important consideration if you are going to make a living producing school photographs. Your pricing should obviously take into consideration both the time taken up by the shoot and also the work represented by the processing and printing. Furthermore, you should be looking to spread the cost of your equipment over a series of jobs; perhaps over the course of a year or more. It is also important to look at the prices offered by your competitors; if you can produce school photographs of the same quality, you should be looking to undercut them wherever possible. This is particularly important in a field in which companies survive on repeat business; you are likely to find that your major challenge is persuading schools to use your company and not the company they have been using for the past decade.